The Bharatiya Janata Party’s (BJP’s) emphatic victory in the 2014 Lok Sabha elections reopened the question of alliances amongst various political parties in the country. In the results declared on Friday, the BJP, which went into the polls with a clutch of pre-poll partners under the National Democratic Alliance (NDA) umbrella, managed to garner 282 seats on its own and 325 with its allies. This is the first time after 1984 that a single party has crossed the 272 mark on its own. In contrast, the Congress-led United Progressive Alliance (UPA), which counted the support of more than 300 members of Parliament (MPs) in 2009 when it was re-elected for a second five-year term, was reduced to a historic low of 61 in 16th Lok Sabha. The election results had thrown Indian politics into a flux but the two main alliances were likely to remain intact for different reasons, analysts say. “The BJP has gotten elected as part of or as the big brother in the NDA. I would not say the coalition era has ended or disappeared or that the NDA is defunct," said Bidyut Chakrabarty, professor of political science at Delhi University. A reason why the NDA will remain intact is because it is a minority in the Rajya Sabha, where it has just 48 MPs in the 245-member house, while the NDA has 60 seats. “The biggest challenge for the BJP is that their big numbers in the Lok Sabha are not matched with their numbers in the Rajya Sabha," said Balveer Arora, retired professor, New Delhi-based Jawaharlal Nehru University. “The alliance with other parties becomes important to enable the BJP to implement their reform agenda and push forward their economic policies." The AIADMK, BJP and TMC together have 28 seats in the Rajya Sabha. The BJP has its own government in Gujarat, Rajasthan, Madhya Pradesh, Chhattisgarh and administering Punjab in alliance with the Shiromani Akali Dal. “We have a comfortable majority but we don’t want to rule just on the basis of majority, we want to build a consensus," BJP spokesman Balbir Punj said. “We want people with all shades of opinion to join hands with us. We are open to whosoever may want to extend their cooperation. Such consensus will help us push our social and economic policies forward." India’s first coalition government— that of the Janata Party headed by Morarji Desai—took office in 1977 but could not stay in government longer than two years despite a change in prime minister. The next coalition National Front government was in 1989 led by prime minister V.P. Singh. This government—which also saw a change in prime minister— did not last more than two years either. The following government, which came to power in 1991, was a minority Congress government supported from the outside by parties but lasted its full term. National polls in 1996 produced a fractured verdict and the United Front government, also a coalition, collapsed within two years of coming to power. Mid-term polls saw the BJP come to power with the help of a dozen coalition partners but the government lost a confidence vote in Parliament in 13 months but came back with a renewed mandate and went on to give the country the only stable coalition government that completed its full term of five years. 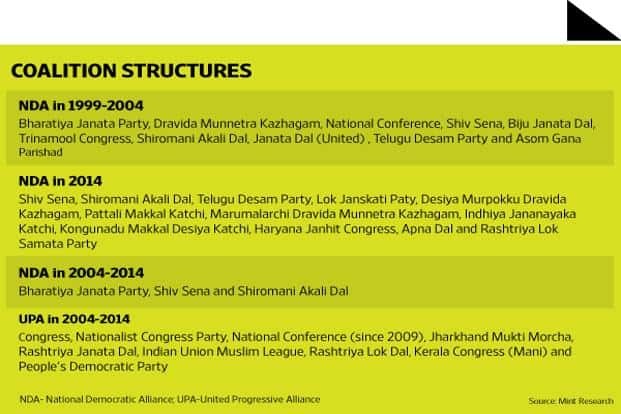 In the 2004 national polls, the Congress-led United Progressive Alliance (UPA) government came to power after forging a pre-poll alliance. The alliance won a renewed mandate in 2009. But weighed down by a series of corruption allegations, the UPA managed to garner 61 seats in the just-concluded national polls. While the emphatic victory of the BJP will mean surplus support, the dismal performance of the UPA may raise questions about the sustainability of its existing alliance. According to Chakrabarty, the poor performance of the Congress’s allies in the 2014 elections was because of their association with the Congress-led alliance which was seen as venal and corrupt. He was referring to a series of corruption allegations that took the sheen of the UPA government which came back to power in 2009 on a pro-poor ticket. “Neither the Congress nor any of its partners are in a strong position which means they are going to stay together at least till the time they recover. There are also many states where the Congress is in power with an alliance partner. Leaving the UPA umbrella could strain those alliances. So I think for the time being they will stay together if only to survive," Chabrabarty said. “Realignments could happen later," he said. According to Arora, this was the third time the Congress had been defeated badly though the tally had been so low. “The party however cannot be written off, it will have to reinvent itself," he said. “People are fed up of the incumbent government but there is no question of it becoming untouchable."